Is Naw-Ruz an Iranian Holiday or a Baha’i Holy Day? Ever so often, we’ll be putting up posts for our ‘Common Questions Series’. As the name suggests, these are questions about the Faith that we often get. You know those ones – where you kinda, sorta, maybe know the answer but aren’t sure if you know enough to give the asker a full response? Yeah, those ones. Baha’i Blog has decided to make a collection of those questions, which will hopefully be as helpful to you, our readers, as it is to us! We’ve been getting a few questions recently about Naw-Ruz and its origins as a Baha’i Holy Day, so we’ll start with that! 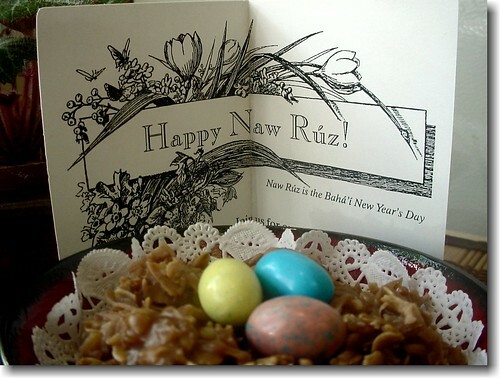 Naw-Ruz (which in Persian literally means “New Day”) is a New Year holiday for both Iranians and Baha’is celebrated on the first day of spring but the significance and celebrations between the two are slightly different. The Baha’i celebration of Naw-Ruz is one of the nine Baha’i Holy Days on which work is suspended, and it was established by Baha’u’llah, the prophet-founder of the Baha’i Faith, to mark the feast day following the 19-day month of fasting. (The Baha’i calendar is made up of nineteen months, and each month consists of nineteen days). The Baha’i fast is essentially a reflective time of year, where those who are able, abstain from food and drink between sunrise and sunset. … This sacred day when the sun illumines equally the whole earth is called the equinox and the equinox is the symbol of the divine messenger. The sun of truth rises on the horizon of divine mercy and sends forth its rays on all. This day is consecrated to this commemoration. It is the beginning of the spring. When the sun appears at the equinox it causes a movement in all living things. The mineral world is set in motion, plants begin to sprout, the desert is changed into a prairie, trees bud and every living thing responds, including the bodies of animals and men. The rising of the sun at the equinox is the symbol of life and the human reality is revivified; our thoughts are transformed and our intelligence is quickened. The sun of truth bestows eternal life, just as the solar sun is the cause of terrestrial life. The day of the appearance of God’s messenger on earth is ever a sacred day, a day when man commemorates his lord. As with most Baha’i Holy Days, there are no particular fixed rituals or practices associated with the holiday. With adherents from so many parts of the world, the Baha’i Faith makes careful attention not to impose one cultural tradition upon other traditions but rather to encourage an organic international Baha’i culture that emerges based on the Holy Texts and not on personal or cultural traditions. So, on an international level, the celebration is generally observed with a meeting consisting of prayers, feasting and joyful celebration open to all. What that actually looks like from one place to another largely depends on the way in which a Baha’i family or community chooses to celebrate the Holy Day. Although celebrated in a different fashion, Naw-Ruz is also celebrated by Iranians and Zoroastrians as the new year. The origins of Naw-Ruz are unknown but it is thought to have begun as a pastoral spring festival. As time turned, Naw-Ruz gradually became a secular holiday in Persia and, as such, continued to be observed even after the spread of Islam in Iran. Muslim kings in Iran, like their Zoroastrian predecessors, celebrated Naw-Ruz with great magnificence. Though not a Baha’i tradition, some Baha’is from a Persian background honour the traditions associated with their cultural heritage by infusing their celebrations with elements of a traditional Persian celebration of Naw-Ruz. These traditions might include families gathering in new or freshly cleaned cloths or the decoration of tables with fruit, cakes, coloured eggs and other treats, as well as symbolic objects such as a holy book and a mirror. Among the best known customs of Iranian Naw-Ruz is the “haft-sin” – which in English translates to the `seven S’s’. These are seven objects whose Persian names begin with the letter ‘S’ such as hyacinths, apples, lilies, silver coins, garlic, vinegar and rue, which are chosen and decoratively arranged on a table. Persian traditions or not, Naw-Ruz always comes with generous hospitality and a delicious feast to enjoy! What about you? We’d love to hear how your respective cultural backgrounds and the associated ideas of new year celebrations have shaped the way you commemorate the Baha’i New Year! Very relevant and useful. Thanks for sharing! As a relatively new Baha’i I have been fortunate enough to have experienced 2 Naw Ruz celebrations so far. One in Madrid last year and then one in Melbourne this year. As you said Naysan, the nights both began with prayers and then went on to celebrations each a representation of the people in the community. Awesome post, Nays! I remember thinking, at my first few celebrations as a new Baha’i, how interesting it is that celebrations vary so widely even within one country, depending on the backgrounds of the members of a community. I love that there is so little ritual associated with the Holy Days. It’s often very easy for culture and spirituality to become confused, and I think it’s really valuable that human traditions (as culturally rich and exciting as they are) be distinguished from the spiritual laws laid out in the Scriptures. To be honest, when I was working on this post it made me realize that growing up, I actually never realized that there was also an Iranian holiday called “Naw-Ruz” until I left Papua New Guinea and went to university. I always thought Naw-Ruz was a Baha’i Holy Day. Even though my parents come from a Persian background, they always treated it as a Baha’i Holy Day and never included the Persian traditions relating to the holiday. It’s not that they were anti-persian or anything, but perhaps more into the significance of the Holy Day, and I think they took care not to intertwine the two, and I’m glad they did that. In turn I share with you something I recently read about Naw-Ruz. In the ‘Shahnameh’ (The Persian Book of Kings) composed by Ferdowsi 1000 yrs ago, the feast of Naw-Ruz is said to have been established during the reign of the mythic legendary King Jamshid. Naw-Roz means New Day in english and it’s have big history in ancient Iran history , and I’m sure these holidays and this celebration is one of most important iranian’s celebrations because i’m Iranian . Today last day of these holidays called “Sezde beder ” that people go to picnic and barbecue and enjoy from spring Beauty …. That’s a great article… I especially like the quote from ‘Abd’ul-Baha about the Equinox. Nou Ruz is the name of the celebration that is happening on the first day of the first month ( Farvardin). I sometimes think that there is a wisdom on the fact that Baha,u’llah had used the word “Nou Ruz” instead of useing “the first day of Farvardin”. I think that Baha’u’llah gave a rebirth to an ancient tradition to make it a tradition for the whole world,being the second manifistation of God from Persia. Thank you I am enjoying the blog it is really informative, good work. I have been a Baha’i since 1984 and at that time I had 2 young children and I wanted to make Ayyam-i-ha a special time, as you know it is 4 to 5 days long depending on it being a leap year, and having 4 members in the family, we decided that one day belonged to each of us, so on your day you gave presents to the rest of the family and had your special treat food for dinner, (like roast pork or cabbage rolls with trifle) so that worked out rather well and it became a special time in our family and still is. The young ones are grown now and have or are starting their own families and we still make it a big occasion with a picnic and presents. Building a Baha’i identity in the family is also important I think, memories are a powerful thing they help spread the joy we share with everyone. We only give presents that are home made, brought in a charity shop or IOU’s such as babysitting during the year. Having an allocated day for each of the kids is such a great idea! Thanks for sharing Elizabeth, and I’m glad you’re enjoying the blog – thanks for your support! Thanks for clarifying that…cos many times you go to functions and the Persian component takes root! IT is a new concept!! Thank you heaps for creating this blog. . I had never heard of Bahai faith until I was invited during the christian festive season by two close youth friends to attend an intensive Ruhi training brom Bk1 to Bk 5. I became a Junior Youth animator, I fasted for the first time and then came Naw-Ruz. Witnessing how Naw-Ruz was organized with great simplicity and Joyful fellowship really attracted me into this light. I became a Baha’i on April 21st, 2012.